"Unspoken" speaks volumes about the harmful impact of stereotypes on the conversation surrounding Asian-American mental health. Director Amanda Huang uses personal narrative to bring this issue to light and expand this conversation. As the winner of Short Waves, Huang will receive an all access festival pass and showcase her film at the 2016 Boston Asian American Film Festival this fall. This film is a personal narrative of the life of Brian Cho. Tak Toyoshima is an Asian American art director with the Weekly Dig and the author of the comic strip Secret Asian Man. According to an interview with AArisings, Toyoshima is a second-generation Japanese American born in New York City. He received a degree in advertising from Boston University, and currently resides in Boston. Asiroh Cham is a Cham American, born in a refugee camp in Thailand, but has spent the majority of her life in California. In 2010, she traveled to Cambodia to co-direct a documentary on Cham genocide survivors in the midst of the U.N. backed tribunals. Asiroh recently worked on the documentary The Killing Fields of Dr. Haing S. Ngor, directed by Oscar nominated director Arthur Dong, which is nominated for the Focus International award for Best Use of Footage in a Factual Production. Asiroh holds a B.A. in Southeast Asian Studies & International Development Studies and an M.A. in Asian American Studies, both from U.C.L.A. 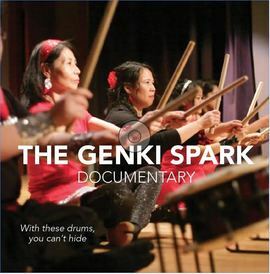 This film is a look into the experiences of Asian women in America, exploring issues of race, culture, and identity. It is a story about embracing the uniqueness of every individual with the support of a sisterhood, claiming one's culture, empowering those voices often kept silent, and sharing that strength with the community to advocate respect for all. ​Misako Ono Born in Japan and raised in New York, Misako is a photographer, graphic designer, and documentarian. In May 2015, she earned her B.A. in Sociology at Tufts University with a minor in Communications and Media Studies. While at Tufts, she participated in the Program for Narrative and Documentary Practices through the Institute for Global Leadership, where she created a multimedia story on homebirth and midwifery in Cambridge, MA. She has traveled to Dhaka, Bangladesh to develop a photo essay on women's education, and to Rio de Janeiro to collaborate on a multimedia project on Hepatitis C and the lack of access to affordable medicines. Her work addresses the issues of health, social inequality, and women's rights. 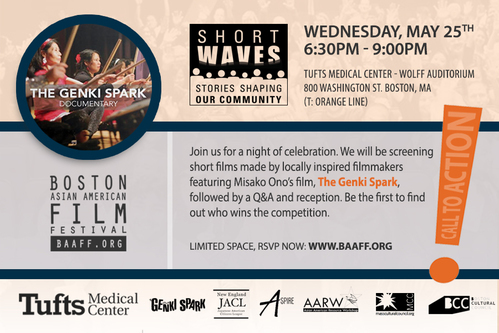 As the winner of Short Waves, Thuan Hien receives automatic acceptance into the upcoming Boston Asian American Film Festival. His film is a short documentary explores the interconnectedness and complexity of his 'mother and son' relationship. That closeness has nothing to do with distance and the one thing that binds them is a shared refugee experience. As filmmaker Hien quotes, "It is important that these stories of the Vietnamese refugee people do not die and go unheard; their legacy must be heard." Public online voting begins 1 week prior to event. Winner will be announced during this event. Free food will be provided.